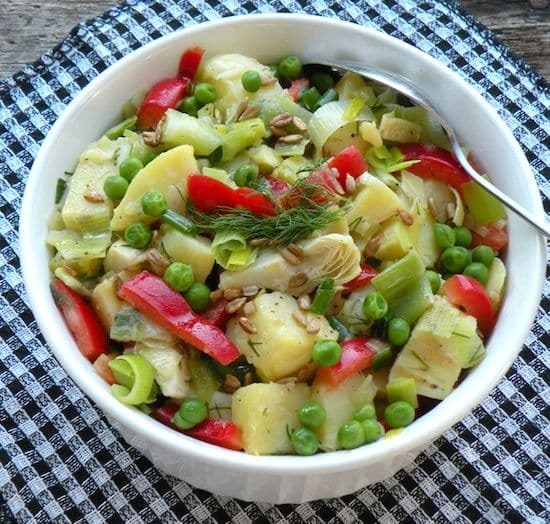 Here’s a dressed-up potato salad that’s easy to make, with the warming touch of leeks. It’s great with grilled dishes, and is a nice potluck or company dish for spring and summer. Cook or microwave the potatoes in their skins until done but still firm. When cool enough to handle, but still warm, cut in approximately 3/4-inch chunks. Place in a serving bowl. Trim the leeks and cut in half lengthwise. Cut 1/4-inch thick crosswise, then rinse well in a colander. Separate the rings and mix them up a bit with your hands, to make sure you get rid of all the grit. Heat the olive oil in a large skillet or steep-sided stir-fry pan along with 1/4 cup water. Add the leeks, then cover and cook until tender, stirring occasionally, about 8 to 10 minutes. Add a bit more water if the skillet gets dry; on the other hand, if any liquid remains, drain it off. 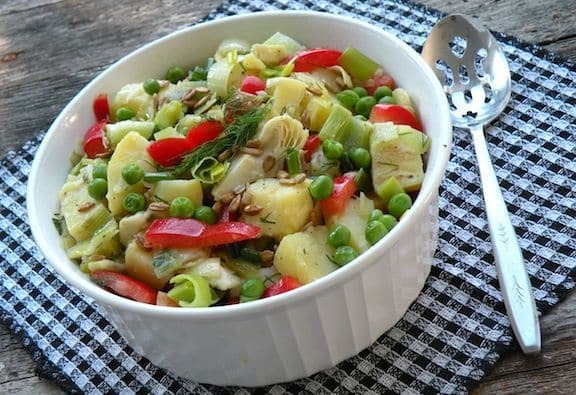 Add the leeks, artichoke hearts, bell pepper and peas to the bowl with the potatoes. Add enough vinaigrette to moisten the ingredients. Stir in the scallions, dill or parsley, and sunflower seeds. Season with salt and pepper and stir together gently and thoroughly. Serve at once or let stand at room temperature until needed. Thanks for all the info. I have been in a panic the last few months. My daughter is very allergic to milk. When Vegan Rella disappeared, we tried all sorts of different vegan brands of cheese, but she hated them all! We are up in Calgary Alberta Canada so I hope we will see our fave vegan cheese back soon!! I am also wondering if anyone has the contact info for Vegan Rella. I’ve searched the web and can’t see it for some reason.Thank you! Hi Laura, glad you found the information useful. That is the only allergy friendly cheese that I know of that actually melts. Have you tried 100% dairy free, soy-free, gluten-free Rice Cheese Slices? It is made by a company called Galaxy Nutritional Foods.